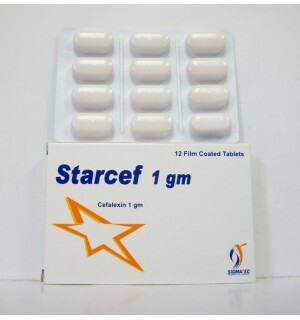 Cefalexin monohydrate 1051.8 mg equivalent to 19. Cefalexin. Cefalexin monohydrate 525.9 mg equivalent to 500 mg Cefalexin. Lactose, Sodium starch glycolate, Aerosil 200, Magnesium stearate and Sodium lauryl sulphate. powder, Quinoline yellow color and Sucrose. resistant isolates), Streptococcus pyogenes, Streptococcus pneumoniae, Streptococcus agalactiae (Group B),other beta -haemolytic streptocd and most viridans group streptocci are also highly susceptible to Cefalexin. Shigella species, Neisseria qonorrhoeae. N. meningitides, Haemophilus influenzae and BranhamelJa catarrbahs are also susceptible. a 1000 mg dose) are usually reached at 1 hour and therapeutic levels are maintained for 6-8 hours. Absorption is delayed when Cefalexin is giving with or shortJy after food, but the total amount absorbed is not altered, absorption of Starcef is not adversely affected by cellae disease, partial gastrectomy, achlorhydria, jaundice or diverticulosis (duodenal or jejunal). therapeutic levels in the blood, urine, bile, synovial fluid, pus, tonsillar tissue, amniotic fluid, cord blood and foetal blood. Cefalexin is not metabolized in the body. Ear, nose and throat infections: otits media, mastoiditis, sinusitis, follicular tonsillitis and pharyngitis. Urinary tract infections: acute and chronic pyelonephritis, cystitis and prostatitis. Prophylaxis of recurrent urinary tract infection. Skin, soft-tissue and bone infections. Gonorrhoea (when penicillin is unsuitable). Dental procedures: treatment of dental infections. As prophylaxis treatment for patients with heart disease undergoing dental treatment as an alternative to penicillin. The adult dosage ranges from 1-4g daily in divided doses. scheme of 500 mg three times daily will be found satisfactory. Ideally, dosage should be calculated on a body-weight basis, particularly in infants. In the therapy of otitis media, clinical studies have shown that a dosage of 75 to 100mg/kg/day in 4 divided doses is required. In elderly patients. the possibility of renal impairment should be considered. of the wide therapeutic window of Starcef. the standard recommended doses should be halved only in those patients with severe renal impairment (creatinine clearance less than 10 mUmin). – Hypersensitivity to any ingredient of the preparation. – Patients with known hypersensitivity to cephalosporin antibiotics. colitis may appear either during or after antibiotic treatment dyspepsia and abdominal pain have also occurred. Eosinophilia, neutropenia. thrombocytopenia, and haemolytic anaemia have been reported. Other side effects includes: dizziness, fatigue, headache, agitation, confusion, hallucinations, arthralgia, arthritis, and joint disorder. – Concurrent treatment with high doses of Cephalosporins and nephrotoxic drugs such as aminoglycoside or potent diuretics (e.g. to be a problem with Starcef at the recommended dosage levels. – As with other beta-Iactam drugs, renal excretion of CefakJxin is inhibited by probenecid. administered with caution during the early months of pregnancy. Lactation: Cefalexin is excreted in human milk in low concentrations and should be used with caution in nursing mothers. – Special care is indicated in patients who have experienced an allergic reaction to penicillins or other beta-Iactams. Enterococci, Clostridium difficile), which may require interruption of treatment. diagnosis in patients who develop severe diarrhea durin~ or after antibiotics use. unlikely to be of clinical importance. with’ Clinltest’ tablets, but not with enzyme-based tests. be due to the drug. – Starcef suspension contains Sorbitol powder, so it should be used with caution in cases of diabetic patients. containing 250 mg Starcef in each 5rn!. Shake the bottle well before use. Store in a dry place at temperature not exceeding 3O”C. Store at temperature not exceeding 30″C. Reconstituted Starcef suspension retains its potency for 10 days when kept in a refrigerator (2-S”C). Sigma-Tec Pharmaceutical Industries. Egypt. S.A.E.